Following the example of the Protestants, the “Orthodox” who separated themselves from Rome – as we have seen in previous articles (here and here) – fell into schism and heresy and divided into various autonomous churches. They are erroneously called orthodox for they removed themselves from the Catholic Church precisely because they despise Catholic doctrine, Catholic orthodoxy. Their internal fights led them to fracture into many autocephalous or autonomous churches. This is why there are different schismatic churches in Russia, Ukraine, Bulgaria, Romania and the Baltic countries. 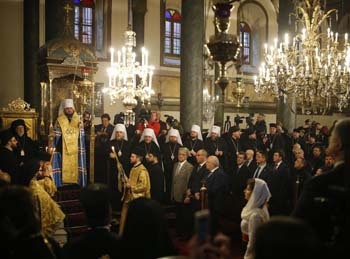 More particularly in Ukraine there are three schismatic churches: the “Orthodox” Ukrainian Church of the Patriarchate of Kiev, the “Orthodox” Ukrainian Church of the Patriarchate of Moscow and the Autocephalous “Orthodox” Ukrainian Church. A more precise breakdown of these numbers is found in another source: “50.4% belong to the Orthodox Ukrainian Church of the Patriarchate of Kiev; 26.1% belong to the Orthodox Ukrainian Church of the Patriarchate of Moscow; 7.2% belong to the Autocephalous Orthodox Ukrainian Church; 10.2% are Roman Catholics (8% Greek-Catholic Ukrainians and 2.2% Latin Catholics); 2.2% are Protestants; 0.6% are Jews and 3.2% are from other denominations including atheists. Habitually the Western man has a distorted idea of this reality. He believes that the “orthodox” form a single church with a coherent and cohesive doctrine. This is not true. In Ukraine there are three different schismatic churches that have almost always been linked to the communists of the Kremlin since the 1917 Bolshevik Revolution. 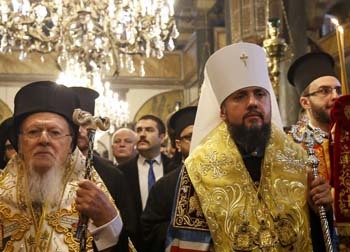 Recently the news spread that the Schismatic Church of Ukraine is declaring its independence from the Russian Church and uniting the three schismatic Ukrainian Churches. These three Churches had always fought one another, each one pretending to be the “true Orthodox” Ukrainian Church. Why now have they reached a pacific union? Why only now have they declared that they no longer can receive orders from Moscow’s Patriarch Kirill, a known KGB agent who is obedient to the rulers of the Kremlin? Fr. Pavlo Vyshkovsky studies the history of the Catholic Church in Ukraine, her religious congregations both male and female, as well as the action of the lay faithful through the centuries. He also details the prohibitions and persecutions of the Czars and the communists, as well as the clandestine activity of religious who were truly concerned about administering the Sacraments of the Catholic Church. My goal here is not to set out the complete historical panorama, but just to unveil the plot behind the unification of the “Orthodox” Churches. For this purpose, I offer the reader the data needed to grasp the deceitful maneuvers made by agents who use the “Orthodox” Church to manipulate public opinion and foster Communism. In Brazil, especially in the South, there is a strong presence of Catholics of the Greek-Ukrainian rite. Although many modern customs have entered the temporal and religious customs of Ukrainians, we can clearly see that they are much more conservative than the Catholics of Latin rite. They still follow the Sacred Liturgy of St. Josaphat and have a youth who cultivate the language and beautiful cultural traditions, which include typical cooking and Cossack dances. The 2014 Russian invasion of Ukraine and its aggression, which resulted in the annexation of Krimea and parts of Donetsk and Lughansk, caused the war that is still ongoing. In this climate of Russian provocation, it was natural for the Ukrainians to react and question their not-so-glorious past dependence of the three “Orthodox” Churches on Moscow. The Ukrainians nurture resentments toward Russia, especially for the Holomodor: In 1931 and 1933, Russian communists oppressed Ukraine by taking all their food production and causing them to starve to death. Thus entire populations were killed by starvation. Holomodor means to inflict death by starvation. It was an organized and planned genocide executed by Moscow. Although it does not enjoy the same publicity as the killing of Jews by the Nazis, the Holomodor is a crime that the Revolution can no longer hide. Estimates point to 10 million Ukranians murdered in the Holomodor. Different from other peoples of Catholic majority such as the Polish, the Hungarians and Lithuanians who rid themselves of the control of Moscow as soon as the USSR collapsed in 1990, only in 2014 did the Ukrainians start to react strongly. They expelled the rulers who were puppets of Moscow and demolished the statues of the executioners of their people such as Lenin and other murderers linked to the KGB. With these data, I believe I can respond to the question of why, only now, have the three “Orthodox” Churches in Ukraine acted to unite. I propose that they did so – with a false spirit of humility – in a deceitful way. It seems to me that if those three schismatic Churches had not moved to separate themselves from Moscow, the Ukrainians would have abandoned them and a considerable number of the lay people would have seen their way to enter the Greek-Catholic Ukrainian Church. 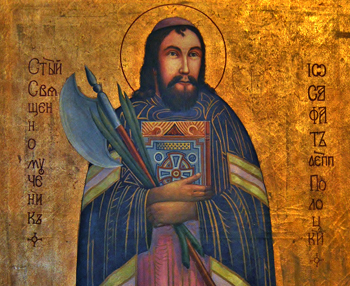 In brief, they would follow the example of St. Josaphat. So, to avoid the conversion of their followers to the Catholic Church, these three churches officially separated themselves from Moscow. Notwithstanding, I believe they continue to be as subservient to Communism as they were before.